Weird WWII: Battleground Weird WWII: PzKpfw VI Ausf. E "Tiger"
Battleground Weird WWII: PzKpfw VI Ausf. E "Tiger"
Notes: These are the rules for the PzKpfw VI Ausf. E we use for our games of BGWWWII. You will need the core BGWWII rule set to know what the hell I'm talking about so get it! Vehicle Chart: You can find a vehicle chart for the Tiger within the BGWWII Tanker's Challenge supplement so get it already! High Ground Pressure: Tigers have high ground pressure because of their massive weight and will suffer an additional +2 on all Bog Checks. 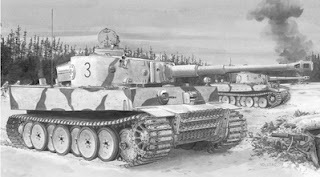 Winterketten or Ostketten Tracks: The Tiger may be fitted with the Winterketten track grousers for use in ice and snowy fronts or from early '44 on with the Ostketten track for muddy battlefields. The Winterketten will provide a -1 to all Bog Checks made in snow or icy terrain and the Ostketten will provide a -1 to all Bog Checks in muddy terrain. Both tracks types will also negate any High Ground Pressure penalties. Availability for each is a 8 or less for any front. Zimmerit Paste: A cement coating was used on German armor that reduced the ability of magnetic mines and sticky bombs to attach to it. Any vehicle covered with Zimmerit paste will receive a +10 to the Close Assault Placement score when using a magnetic mine or other similar weapon. The Availability for Zimmerit on a Tiger is 16. Deep Wading Equipment: Early production Tigers where designed to allow for deep wading equipment that allowed the tank to cross water obstacles submerged if need be. The Tiger can start a battle with its deep wading gear fitted and can transverse water by moving at 1/4 its normal speed while in the water. If the vehicle is penetrated while in the water, the tank will be lost and the crew will be KIA unless they pass a 1/4 Skill Check to escape the drowning tank. All To Hit rolls to a swimming Tiger will be at a +1 due to its small size and a +2 if only the snorkeling equipment is visible when in the water. The Tiger cannot fire any weapons if submerged and only machine guns if only partially submerged. Availability is a 5 and only available on early production models only. S-Mine Projector: Early production Tigers had external mine launchers for use against close assaulting enemy infantry. 6 launchers where fitted to each corner and two in the middle of the hull. The mines were detonated by the commander and could be set off all on one side or all at once. Each mine will use the Small blast template and be placed directly 2" away from each corner and mid points of the hull. Once fired, it will take an action to reload the projector at each location. 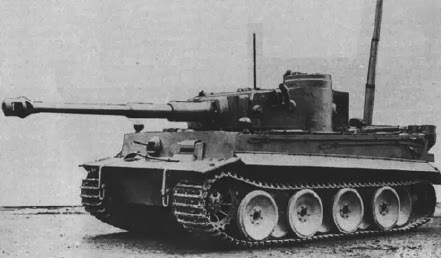 Smoke Grenade Launcher: Early production Tigers used a pair of three-tube, smoke grenade launchers fitted to either side of the turret. The commander uses an action to fire the launcher in which all six tubes fire a single smoke grenade that will then smoke the front 180-degrees of the turret's front. The smoke launcher can only be reloaded externally and it takes a crewman two actions to do so for each of the two launchers. If only one launcher is loaded and then fires, it will only produce a 90-degree smoke cloud to the front side of whatever launcher was fired. This smoke discharger was replaced with the Nav. launcher in late production models and retrofitted to many of the early production turrets as well. Availability is 15 on only early production models. Nahverteidigungswaffe: Late production Tigers are fitted with a launcher in its turret that is capable of firing small shells from within the safety of the turret. The launcher has a 360-degree field of fire and is capable of firing fragmentation, smoke or flare shells. It will cost the loader one action to load and another to fire the Nahverteidigungswaffe. The launcher may be rotated 180-degrees and be fired in the same action it moved. Both the fragmentation and smoke shells produce a Medium-sized template when fired. The shell's template can be placed anywhere along a 360-degree arc, 2" away from the center of the vehicle. The crew must be Buttoned-Up when the Nahverteidigungswaffe fires a fragmentation shell. Note that if any turret crew are exposed, the weapon will not be used until they duck down into the turret or they Button-Up. This is due to the possibility of the round striking one of the crew while exposed. Use the WYSIWYG rule to determine the Availability. IR Upgradable: Late model Tigers are able to be fitted with the Sperber/FG 1250 "Falcon" IR System as described in the IR Rules. Availability is a 15 on the Eastern Front, 10 on the Western Front and an 8 on any other front. Pistol Ports: Early production Tiger turrets were fitted with a pistol port for both the loader and commander. These ports allowed the crew to fire their side arms from within the vehicle usually at assaulting enemy infantry. The commander and loader may fire their pistol or machine pistol out of a pistol port by using an action in doing so. All pistol ports have a 90-degree fire arc and will always suffer a 1/2 To Hit penalty. Note that prone infantry 1" away from the vehicle cannot be hit by fire from these ports and infantry within 2" will receive partial tank cover from fire from the pistol port. The pistol ports were dropped in later production models in favor of the defensive ability of the Nahverteidigungswaffe launcher. Use the WYSIWYG rules to determine the Availability and port location. Panzer Phone: It was found that infantry had a hard time communicating with panzer crews without exposing themselves or the crew to enemy fire so taking an idea from the Americans, the Tiger was fitted with a simple field phone fitted in a box mounted at the rear right side of the hull. This phone allowed infantry to communicate with the buttoned-up crew without exposing them to possible enemy fire. This upgrade allows Buttoned-Up crews to be aware of any enemy units that the accompanying infantry are aware of just as long as a single figure is manning the tank's phone. Availability is a 12. Pzgr.40/43 Round: The rare Pzgr.40/43 is a high velocity, sub-caliber, tungsten core round issued in limited numbers to units that were expected to face the heaviest of Russian tanks like the IS3. Although the penetration is more powerful than the standard AP round, it was not fitted with an explosive filler charge so it did not cause as much damage once it penetrated the enemy's armor. Because of this characteristic, this round will suffer from a +1 penalty to the Vehicle Penetration chart if the round penetrates its target. This round has an Availability of 5 with D4 rounds available per vehicle. Panzerbefehlswagen: The command version of the Tiger had its co-aux machine gun, loader's side turret vision block and the turret periscope uninstalled as well as its main gun ammunition reduced to allow for the extra radio equipment. This version also saw the addition of an antenna in the turret and a "Star" antenna on the rear engine deck but otherwise looks and fights as a normal production model. 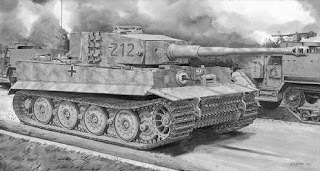 Wargaming Piece: There are several companies that make 1/48 and 1/50 scale models or toys of the Tiger in its various stages so just use some Google-Fu and see what you find. *1-Early production Tigers have a smoke discharger Availability of 15 and the late production model is at a 19. *2-Early production Tigers AAMG Availability is 10 and the late production's Availability is 15.